COMBAT OUTPOST PASERLAY, Afghanistan – It’s a relatively quiet day here on this outpost in Trek Nawa, but that doesn’t mean we can’t have a serious conversation to which we can all relate. Deployed U.S. service members in Afghanistan put up with a lot. Not only is there the threat of improvised explosive devices, small-arms ambushes and indirect fire attacks, there’s the lousy food, hostile weather and lack of plumbing. That, of course, leads to a subject we’ve probably written about too frequently on this blog: poop humor. Yes, you may remember previous blog entries about farting in Afghanistan and learning to use a “wag bag,” a plastic pouch in which human waste is disposed when there’s no plumbing. Photographer Colin Kelly spotted the poster depicted above at Camp Bastion, the British base in Helmand province that is home to thousands of deployed Marines in aviation units. Clearly, a frustrated Marine leader somewhere decided the best way to crack down on messy port-a-johns was to post some rules of the road. And if you’re going to lay the law of the lavatory down, a little sarcasm and blunt talk never hurt. 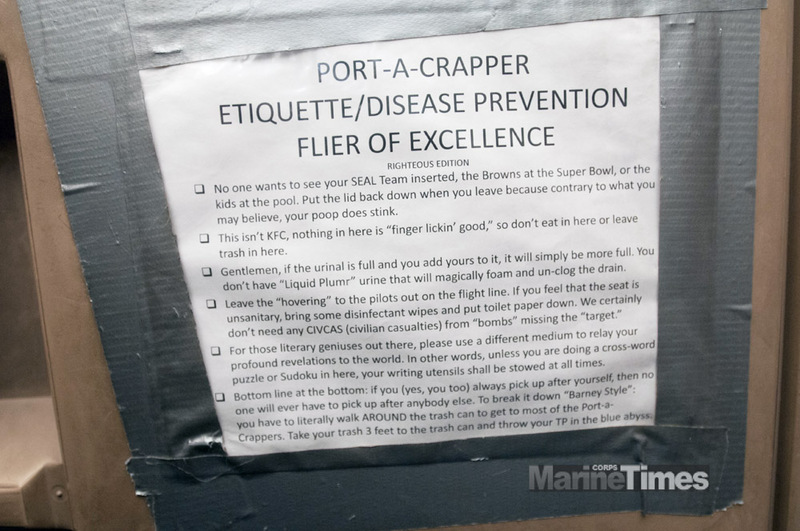 The “Port-a-Crapper Etiquette/Disease Prevention Flier of Excellence,” as this poster is known, does all of that and more. It even warns about the dangers of inserting a SEAL team without a plan afterward. Good advice, no? In all seriousness, we shared this poster because it’s important to keep a sense of humor in a war zone. Going to work for months on end with danger present and loved ones far away is difficult, and it is best handled with a little humility and cheerfulness.